Whether you are planning on self-publishing or taking the traditional route by finding a literary agent, you are going to need to build an author platform. Literary agents today are not only looking for great writers, but also for those who can market themselves. Of course, if you take the self-publishing route, you are on your own, so marketing yourself is an absolute imperative. If you have already published, and do not have a clear idea of how to market yourself and your books, it is time to play catch up. Writing books and marketing, however, are two skill sets that are so far opposed that many authors shudder at the thought of having to turn themselves into hyperbolical salespeople. But yelling and screaming in imperatives is not what it takes to create an effective platform. All it takes is a little planning, some time management and a good dose of determination and patience. First base for action for building your author platform is your blog. Do not even think of using a static website. The graphic below illustrates how fundamental a blog is to the movement of information between other platforms on the Internet. A blog is alive, ever-changing, flexible and extremely communicative. Your blog is your home base, and from there, you can start to build your author platform. Every article that you post on your blog is one additional communicative element that feeds social media, search engines, gives pathways to your buy pages, and most importantly of all, is the conduit to building an emailing list. This is the real pot of gold, and what a genuine marketing platform needs to be built upon. Always give your blog visitors a way to subscribe. As old-fashioned as email is, it is still by a very long way, the most powerful means of getting your message out. To be really blunt, 100 Facebook posts do not even come close to having the same effect as one well written and targeted email. This was a lesson I learned the hard way. I was too lazy, thinking it was all too difficult to build my own email list, and instead, concentrated all my efforts on social media. More fool me, and a waste of a few years. Don’t make my mistake. Take a look at Mailchimp and Aweber, as they are the leading email building services on the Net, but there are many others providers that will work very well too. When you release a new book or have a promotion or free days on Amazon, your email list is what will make these events a success. As far as which blogging platform is best, I would have to say that WordPress is becoming the leader, without a doubt. Either wordpress.com, which is an online platform and very easy to set u or a self-hosted WordPress site, which is definitely not for those without some degree of technical ability. However, if you are really serious about blogging, learning how to use a self-hosted WordPress site is the way to go in the end, as there are so many more functions, features and plugins available. The one platform I would advise against using now is Google’s Blogger. Google is phasing out or losing interest in many of their RSS based projects, such as Reader and Feedburner. This may not bode well for the future of Blogger. With whichever platform you use, posting regularly on your blog is the primary key to generating traffic and therefore interest in you and your books. This doesn’t mean writing until your fingers bleed and posting four times a day. Once or twice a week is ample, so long as you make the most of your post. But simply publishing it on your blog is not enough. You have to aggressively spread the word about every blog post you write. Always, and I mean always, add your blog post to every single social media platform that you can find. Facebook, Twitter, Google+, Stumbleupon, Pinterest, Digg, Reddit and any more that you can find. This is a case of enough is never enough. In the last few days, I had one blog post go absolutely viral. By this, I mean over 7,000 page views in one day! My average day’s page views are 500. It took me a little while to find out that it was all due to a Twitter follower posting one of my blog articles on Flipboard. Never underestimate the power of social media. But, you have to write a blog post first to make it happen! 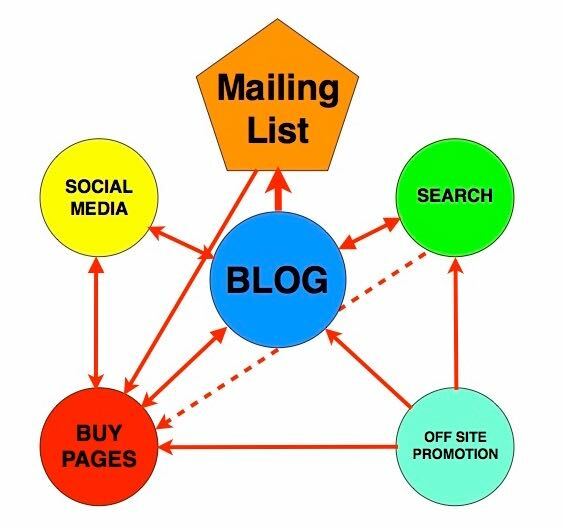 In the graphic above, you can see that there is a reciprocal movement between your blog, social media, search and even your buy pages. When your blog post goes to Google to be listed in Google search, then people find your listing and visit your blog. People you follow you on social media visit your blog and discover your post, while others discover your post and then follow you on social media. Some may stumble on your Amazon buy page, then want to know more about you, so they click on your Amazon Author Page, and then end up on your Twitter page or blog. It’s all a never-ending circle, so make sure you have all the elements in place for your ‘circle’, which is in fact, your author platform. It is a web that leads to and from many points, but your task is to build as many points as you can on the Web, which lead directly back to you, your books, and most importantly, your blog. Building an author platform that will reap rewards for you is not as difficult as it first seems. Have a blog and post regularly, leverage social media to the max, and always keep building your email list. Once set up, it will take at most a few hours work each week to keep your author platform working hard for you. All good advice Derek. I have been on Twitter and had my own blog for a year now but followers remain very small. I realise through this article and others similar that I need to be spending a lot more time promoting and interacting. I work full time and am trying to write too so finding the time and prioritising is difficult. But the main thing is I really enjoy it and it does fill my commute so it’s not all bad! Thanks again for the post. It takes time, Lindsay. But even 30 minutes each day helps build your base. Thank you for the post. I’m starting out still and while I finish the first draft of my novel (which will end up being edited until my fingers bleed), I’ve decided to start on my platform. I started using twitter and began a blog. https://writewithoutapology.wordpress.com/ The blog is less personal and more so informative for other writers. I’d love for you to check it out! Such a good post. Every aspect is spot on. Saved it in order to re read it to make sure I’ve covered my bases.